That's right! Pinch me! 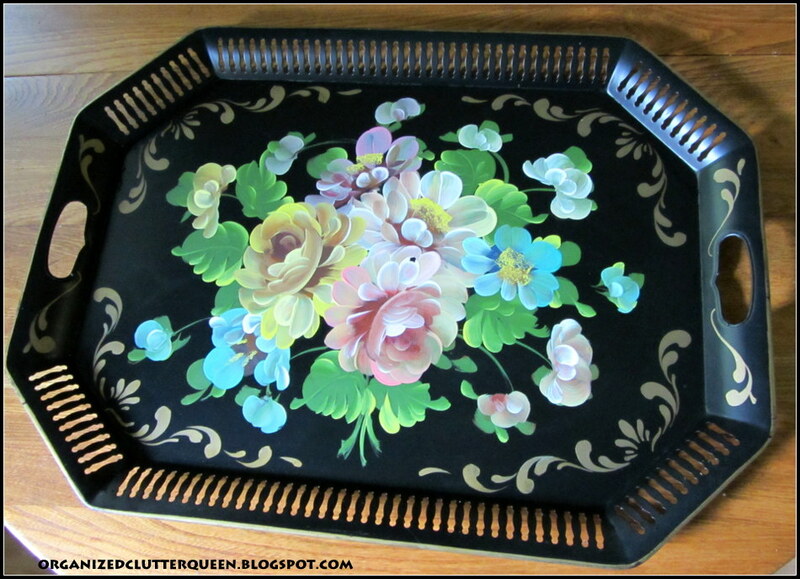 I still can't believe that I found this great vintage black tole tray today! I am off work today, so I was out shopping for autumn decor at a local floral shop and a drug store. I also stopped at an antique store and made one last stop at my favorite local thrift/consignment shop. It had been a slow week thrifting thus far. It is quite large at 17 1/2" x 24", and in very good condition. Almost no paint loss or scratching! The rim has a cut out pattern. 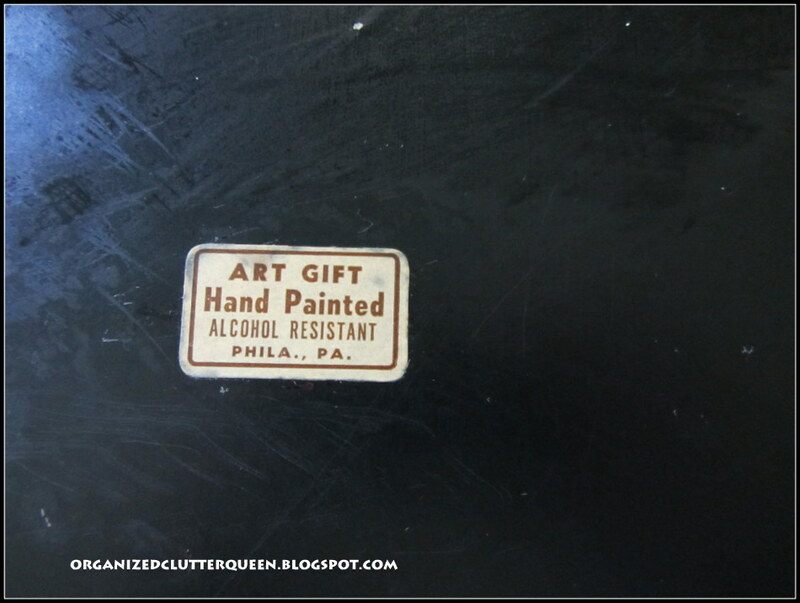 It has a paper label, Art Gift, Hand Painted, Alcohol Resistant, Phila., PA. I'm sure it's vintage! And now for the best part! It was $4. I am not sure where I will put it yet. I may hang it in the foyer/entry as I have turquoise in there and the tray has some turquoise flowers. I have wanted one of these for years, and never found one in good enough shape at a reasonable price. I am not even sure how to hang it! Please leave a comment if you know a good way to hang this large tray. I may hang it lengthwise in the foyer. OMGosh! No, you didn't! I can't believe only $4..wow, was that your lucky day. Love it! I know you'll find lots of places to use it. No way!!! 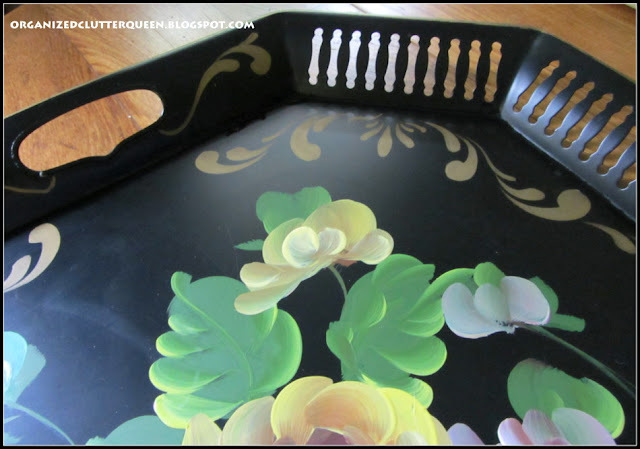 I have quite a collection of painted tole trays and never have I found a large one under $25! Your diligence certainly pays off. GReat find -- I am jealous! This is going to look fabulous on turquoise. You can always use a length of fishing line, tie the ends thru the holes on each side, that's if you don't want it to show. If you want something fancier, play with some ribbon and see if that works. You could have a bow where it hangs on the hook and the ribbons running down to and tied to the handles. Have to see if it will work without the tray falling forward. Great find! This will look terrific on turquoise. Oh, what a deal! I love your new tray - it's gorgeous! Command hooks made by 3M are the best to work with and they won't ruin the tray or your walls. 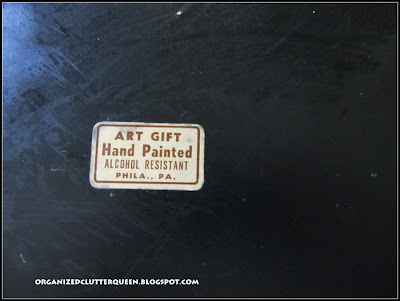 I have some vintage trays that I display in my kitchen cabinets behind plates or glasses, they're very cute! Love it! And only $4 how great is that! What a fabulous find! I always try to pick up these trays when I see them in good condition, but that's not very often. Love the colors. Good job, you got a steal! This is quite a find!! About 15 years ago when i would hit 20 -25 yard sales on a Saturday morning, I was able to find 2 trays like this for $1.)) each!! After seeing this post, i realize that i need to do something with the one that I have packed away!! The other is hanging on the wall in my Powder Room! 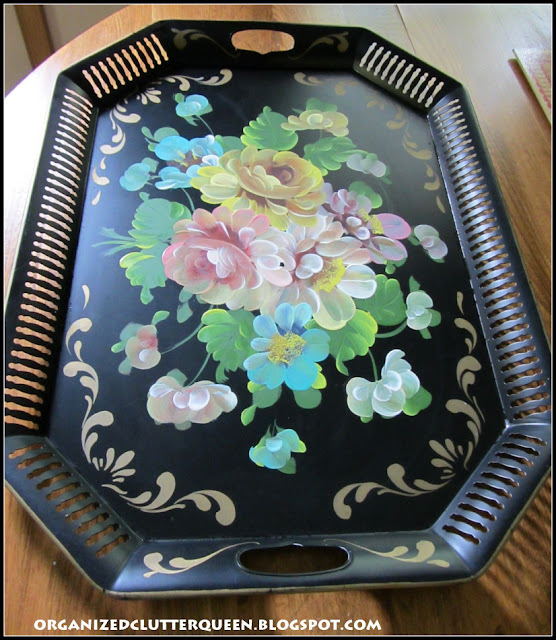 I don't think I've ever seen a more beautiful black tole tray. I would be pinching myself too...and for only $4.00. Great find! you lucky girl, you!!! Black tole trays are one of my "favorite things"! it's in wonderful condition, and wow, what a price! I painted some of those years ago and even took a class. It was popular "back in the day". That's in really good shape and I've never seen one with turquoise...perfect for you! I would get some of those 3M Command strips...they go by weight and won't wreck you paint or your tray. Great find! Came over from Feathered Nest. I collect these also. 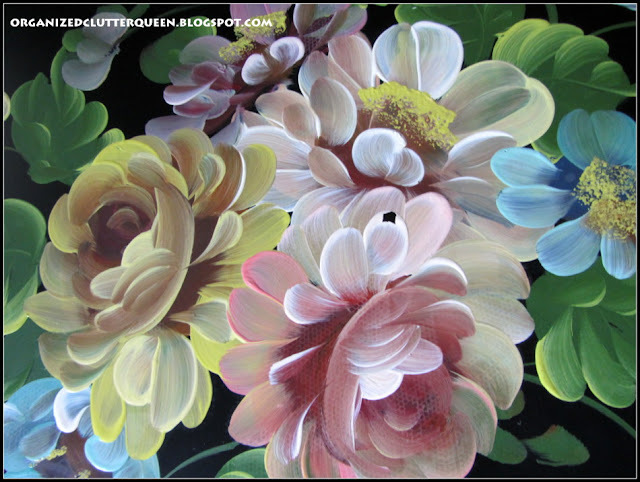 Great deal and I know just where you can hang it - in my house! I have so many that I now restrict myself to ones that are signed. You really scored on this one. I think it'll be gorgeous on the wall. I have a collection of 80+ trays. I have them hanging all over my kitchen walls. I use plate hangers to hang mine. They come in all sizes and just hook over the edges of the trays or through the cut out areas. Then I either use the nail and hanger that comes with the plate hanger or an Ooks wall hanger. Very easy and my trays are hanging very securely. This was a great find! I love trays too! $4 is a steal! I bet you wanted to run with it. I love that feeling of finding the perfect thrifted piece!! It will be soo beautiful with your Fall decor. try some velcro wall patches on your tray, put one on the tray and another on the wall, they make them in all different sizes.Lovely tray by the way! That is one gorgeous tray! What a fabulous treasure and a great price, too! Wow!